2nd Generation Professional Window Cleaning for over 25 years ! My dad, Spiderman S. Mulholland, was a high-rise window cleaner for over twenty-nine years. So I’ve always had a passion for it from a young age. 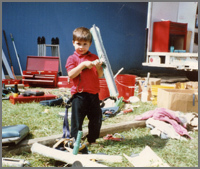 When I was sixteen, my dad gave me the business and taught me all the trade secrets and business planning of running my own business. Sometimes we clean windows together and really have a great time learning the art of professional window cleaning. At first I did not realize how difficult it was to professionally clean windows, but my dad’s training over the years has really helped. He has always told me that customers satisfaction was priority number one. All his life John Mulholland was fascinated by his fathers work and enjoyed ‘hanging around’ and helping in any way he could. Doing a great job that you can be proud of is essential in building a professional and successful company. If you need professional window cleaning for residential, commercial, or high-rise, we can guarantee a reasonable price with great services. 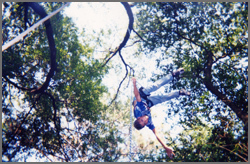 When he was twelve, John would steal his dad’s rappel ropes and practice descending head first from twenty-foot trees. 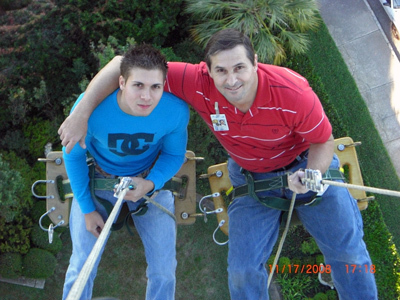 Just recently, Mulholland told me with obvious pride, John had done his first building rappel off an eleven-story office building in Pensacola on a Sunday morning when no one was around. Mulholland pulled up the photos on his computer: a young, skinny boy, smiling like he had just met his sports hero. Mulholland’s plan: when John is ready, he’ll set him up with a $20,000 budget and marketing plan, then transfer his service trademark so that John can be the new here: Spiderman’s Professional High rise Window Cleaning. It will be, Mulholland told me, the completion of a cycle of success that he initiated despite long odds. Give us a call today at 352.284.9454 and put our services to work for you !